Some recent developments, whether they are fruitful or not, have got me thinking seriously about the design of 3D printers, their use and some of their current drawbacks. Additive manufacturing has come a long way even in the last 15 years when it was just a novelty and not useful for much more than rough prototypes. While 3D printing will probably never supplant ‘subtractive’ methods such as turning and milling for most things, I believe it will be a real boon for strange, esoteric and one-off parts with limited mechanical demands. This got me thinking about my own design and what I perceive to be some of the issues with current machines all the way up to commercial machines. A couple of those issues are of concern when making a upper-tier hobbyist grade machines for making prototype parts. These two things are, the effects of gravity on the part when heated or produced, and the effects of uneven heating throughout the process of printing a given part. This will not only increase accuracy but reduce the need for support structures while printing. Having a heated suspension fluid eliminates the wow caused by uneven heating and the droop generated from gravity when the part is properly heated. By keeping the liquid level slightly lower than the workpiece you can still generate lattices without the fear of them filling in. 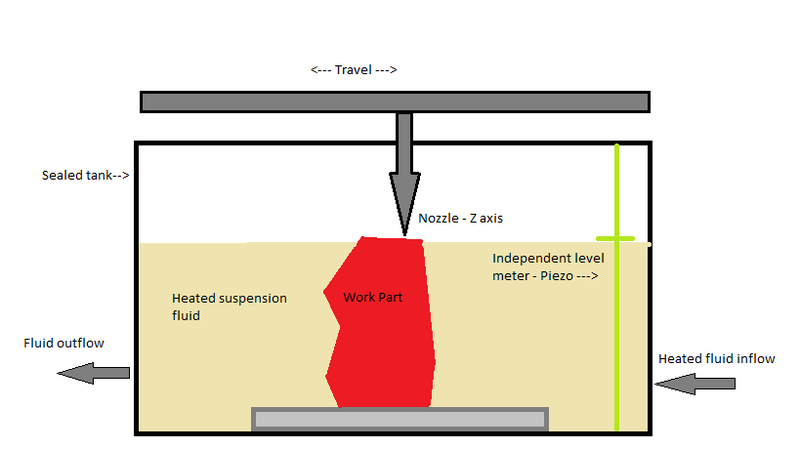 The inflow and outflow should be computer controlled via electric pumps and valves, this way the fluid can remain hot without having to heat the whole enclosure. Draining from the bottom will partially help ensure that the cooler fluid is drained first. You could even add a filter to remove detritus. For the fluid height sensor, I would probably try to tie it in with the nozzle height somehow without interfering with the work envelope. The level would need to be maintained very accurately in order to ensure maximum efficiency. For this sensor I would probably use my old design for a viscometer with the two Piezo discs, instead of measuring viscosity, I would just check for fluid contact, for this purpose it proved to be very accurate and resistant to fouling. For the fluid, it should match the density of ABS fairly closely. Mineral oil or Propylene Glycol might be good candidates. The idea is to have a fluid that is non-toxic, non-flammable, somewhat viscous and chemically inert with plastics. Fragile hollow objects with no holes (a ball) may become deformed due to fluid pressure. though this would require quite a bit of depth to achieve. Not to mention that the item would want to float. Structure needs to be very rigid and acceleration and deceleration needs to be toned down as to not allow the fluid to slosh around which could shake the part loose during printing. potentially messy with fluid being added to the mix. mechanically more complicated and motion components need to be at least resistant to fluid being used. Fluid would probably need to be changed with different materials. A fluid denser than the plastic being laid down may cause issues. Stronger binding to the table is required especially with lattice heavy designs, floating will occur. Anyways, that’s my idea, posted for posterity. Maybe someone will find it interesting or foolish. Next Next post: Testing out my HTML5 compiler with a game, Flarpy!